Keynote speaker Benjamin S. Carson Sr. will receive an honorary doctor of humane letters degree. Five individuals will receive honorary degrees during Emory’s 167th commencement ceremony May 14. As the inaugural recipient of a professorship dedicated in his name, he is now the Benjamin S. Carson Sr., MD, and Dr. Evelyn Spiro, RN, Professor of Pediatric Neurosurgery at Johns Hopkins. 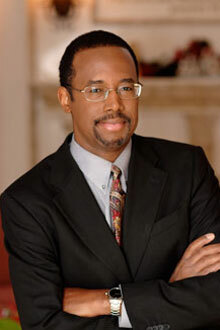 Carson’s achievements include several pioneering medical procedures for conjoined twins. He has written several books, and among his many honors, Carson has been named one of the nation’s 20 foremost physicians and scientists and a Library of Congress “Living Legend,” and he is a recipient of the Presidential Medal of Freedom. Camille Billops, an artist, who will receive an honorary doctor of humane letters. James V. Hatch, writer and professor emeritus, who will receive an honorary doctor of letters. Catharine R. Stimpson, a leader in the advancement of graduate education, who will receive an honorary doctor of letters. Muhammad Yunus, known as the father of the microloan, who will receive an honorary doctor of letters. Billops is a sculptor and printmaker, writer, publisher and filmmaker. She and her husband James V. Hatch founded the Hatch-Billops Collection, an archive of African American cultural materials that they have donated to Emory’s Robert W. Woodruff Library. The collection includes interviews with about 1,400 minority artists of all disciplines. Hatch, a writer and professor emeritus, is the author of several books on African American theater; Hatch is an emeritus professor in the graduate theater program at City University of New York. Together with his wife Camille Billops, Hatch established the Hatch-Billops Collection of African American cultural materials, which they have donated to the Robert W. Woodruff Library. He has received a number of awards for contributions to the arts. Stimpson, a leader in the advancement of graduate education, is dean emerita of the Graduate School of Arts and Sciences of New York University. The scholar of gender studies and feminist theory has authored and edited many works, including novels, numerous essays, stories and reviews for a wide range of publications. Stimpson was the founding editor of “Signs: Journal of Women in Culture and Society,” in the field of gender studies. Yunus, known as the father of the microloan, established the Grameen Bank in Bangladesh in 1983, an endeavor that helped to establish the microcredit movement across the developing world, for which he was awarded the Nobel Prize in 2006. He also established the Yunus Centre to disseminate his philosophy and practices. Yunus has served on the International Advisory Group for the Fourth World Conference on Women, the Global Commission of Women’s Health, the Advisory Council for Sustainable Economic Development, and the U.N. Expert Group on Women and Finance. He is a member of the board of the United Nations Foundation.